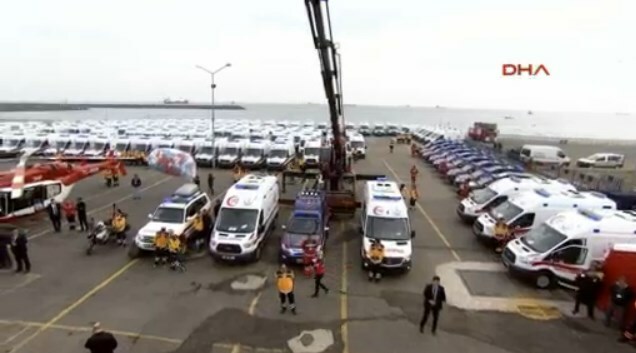 With a spectacular ceremony in Istanbul the Turkish prime minister Tekirdağ, Davutoglu present the new 798 ambulances that enter into service from January in the country. The vehicles, equipped with the newest technology, as Spencer stretchers and devices, will strength the emergency health care system in Turkey. The new ambulance will be available primarily in Balıkesir (12), Bursa (15), Canakkale (8), Düzce (5), Edirne (10), Istanbul (47), Kırklareli (8), Kocaeli (2), Sakarya (8), Tekirdag ‘a (10) and Yalova (8). Turkey will be included in complete review of it’s standard. This step bring the country inside the European border, for the prehospital emergency health standard. Among the 798, 125 are equipped by four wheel drive, 5 with intensive care & obese instruments, 668 of them are with two wheel drive, while 20 of them have a double doors access. The new ambulance will bring the total number of EMS vehicles from 3.770 to 4.586, under the 112, and from 142 to 152 with the UMKE logo. At the Ambulance Distribution Ceremony had participated the Prime Minister mr. Ahmet Davutoglu and the Minister Dr.Mehmet Müezzinoğlu.